The coldest I have ever been in my life was in the mountains of Afghanistan. I was in a helicopter with the windows and doors open. It was dark, the middle of winter, and I wasn’t wearing a jacket. But up there, something became clear to me: America is fighting its wars all wrong.... Thus starts Joshua Foust's riveting and thoughtful account of the U.S. military's engagement in Afghanistan in 2009 and 2010. In early 2009, Foust, a long-time analyst of Central Asian affairs and a respected blogger, got his first chance to go to the country he had been fascinated with for so long. He brought to the trip-- and to this book-- not just a wealth of knowledge about the country, but also an intelligence and sensitivity that informed all his writings during and after the trip. 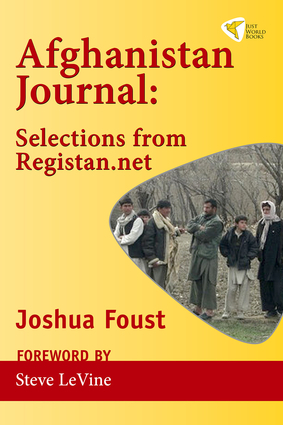 Joshua Foust, author of Afghanistan Journal: Selections from Registan.net, is a blogger with a background in military analysis of post-Soviet Central Asia. His writing, which covers military affairs, geopolitics, and strategic energy issues, has appeared in the New York Times, Reuters, The Christian Science Monitor, and the Columbia Journalism Review. Foust was formerly a fellow at the American Security Project and a member of the Young Atlanticist Working Group.